Elkin City Schools is a small school system in North Carolina serving approximately 1,200 students in three neighborhood schools: Elkin Elementary, Elkin Middle and Elkin High. 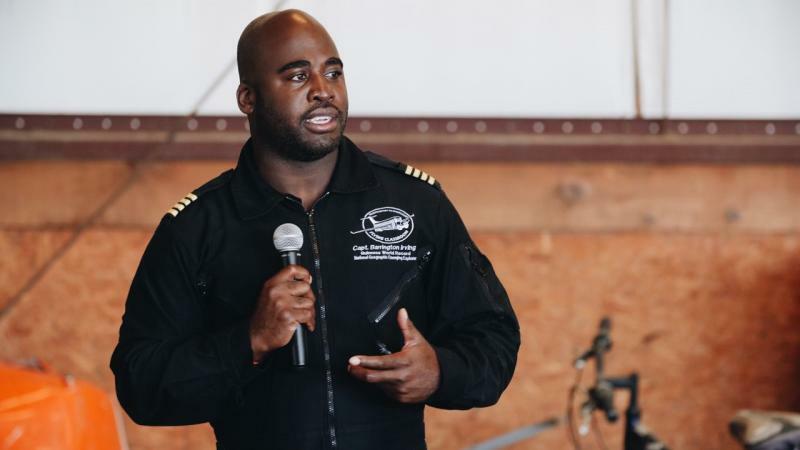 When the opportunity arose for Captain Barrington Irving—the youngest person and first black pilot to fly solo around the world—to land his Flying Classroom at the Elkin Municipal Airport, the faculty, staff and community rallied to make it a reality. I heard Captain Irving’s story at a conference I attended and knew immediately that I wanted my middle school students to get the opportunity to learn from him. His magnetic personality was certainly a draw, but the passion he brings to the work of striving for a better life is what really grabbed me. After all, he turned down football scholarships and, instead, pursued a career in aviation! My goal was to put him in front of students who are exploring careers and making connections between what they are learning and their futures. I wanted them to see that big dreams do come true. While the 170 Elkin Middle school students, teachers, administrators, Board of Education members, the town mayor and community supporters were standing alongside the runway, Capt. Irving swooped down the airstrip in a flyby before making a grand entrance. For many students, this was the first time they had watched a plane land and taxi the ramp. Upon arrival, not only did Capt. Irving disembark, but so did I! I now know that some students thought their superintendent had lost her mind, but for me, it was a thrill of a lifetime. The airport hangar became the students’ classroom for the entire morning. There, they learned about Irving’s exciting and extraordinary expeditions. He took our students on a digital trip around the world, teaching them about deadly sea snakes in Koror, Palau, ecosystems in the Amazon, food waste in California, extreme temperature changes in a halo jump in Tennessee, plus a virtual tour of his very own digestive system through the use of a camera pill! It was truly education beyond the classroom, the very definition of authentic learning. One teacher commented that the students were not just engaged in the presentation, they were mesmerized! When a student is mesmerized, you know you got it right. While Capt. Irving took off to Elkin’s elementary and high schools for school-wide assemblies, his instructional team stayed behind to lead the middle schoolers on an excursion of their own. Students tested their engineering and design skills in a project based-learning activity where they learned how airplanes fly. The “flight crew” (the middle school teachers) distributed materials and teams of students used their collaborative skills to think critically, and create and communicate with one another while discussing the principles of aerodynamics. Measuring flight distance, modifying their “aircrafts,” and retesting for improvements was great fun and made their new learning relevant and meaningful. I knew, without a doubt, that this day would positively impact our students and staff. We gave a copy of Touch the Sky to every student in the middle school, to integrate a literacy component into our STEM event and continue the learning. In a culminating activity at Elkin Middle School a few days later, eighth grade ELA teacher Shannon Swaim facilitated a seminar with her students to reflect on the STEM event. She told me that she kept hearing the students discuss how encouraged and inspired they were by The Flying Classroom, Touch the Sky, and Barrington Irving himself. And I saw that by hosting an electrifying STEM event that was then paired with a literacy component and community engagement, we were able to provide Elkin City students with a multi-layered experience that would ultimately make a profound connection between what they were learning and their own futures.